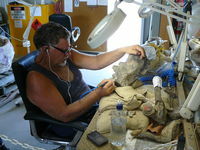 It's been nearly seven years since opening Unique Pets, Pails for Scales, working long hours, seven day weeks. 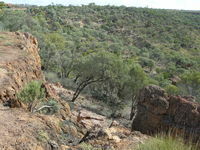 I have been missing my mad runs to Outback Australia. 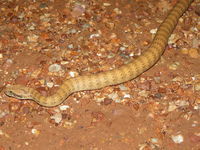 Could I still drive long distances by myself, could I still spot animals like I use to (as I now need glasses), could I still pick up venomous snakes with my hands (due to my arthritis and carpal tunnel problems)? The plan was, take two weeks off and go as far as I could! Starting my break on the Monday, the first two days were the regular routine, feeding and cleaning my reptile collection. I planned to leave on Wednesday, an important meeting came up the following Thursday, which meant I needed to cut my trip back to eight days.I were getting ready to go, the weather forecast wasn't looking good. High rain falls in Northern Victoria, NSW and Southern QLD. What do I do, bugger it - I'm going for it! I thought if I get stuck at least I'll be in the bush, a place I love! Loaded the car, up nice and early and out the door at 4am! As I left Ballarat heading to Bendigo, not far out of town I had my first close call with a Grey Kangaroo, there was lots on the road between Ballarat and Bendigo. I hoped this wasn't going to be a sign of the trip to come, as this was only the first 100 kilometres of many. Things improved after Marong, just before reaching Echuca it started to rain. It rained all the way to Deniliquin. 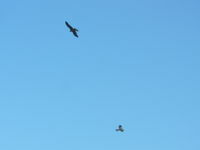 The road from Deniliquin to Hay was a covered in Black Falcons, Kites and Crows. 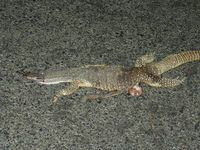 There must have been heaps of insects on the road as there wasn't much road kill. 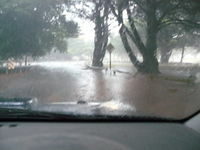 Hey had just received four inches of rain, some water over the flood ways but not too deep. 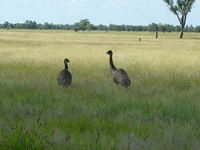 Hay to Goolgowi had lots of flocks of Major Mitchells, they are so beautiful to see in the wild! 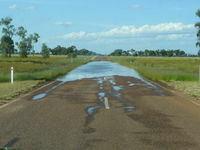 The water was over the road in a few spots just before Goolgowi. Goolgowi to Hillston saw flocks of parrots everywhere. 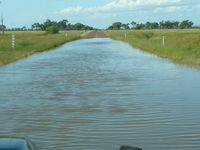 I thought to myself “This is great, loving every minute!” Water over the road in spots, paddocks flooded. I started hearing on the radio about floods in VIC and NSW. Hillston to Cobar more water over the road. 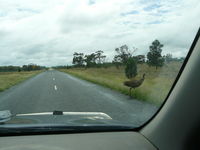 Driving along and all of a sudden from nowhere came an emu; I swerved hard left, honestly not sure how I missed him. I could have wound down the window and plucked out some feathers! Well I'm awake now! A little bit further on, a big tin spot on the right. I’m sure this will help calm me down after the emu scare. 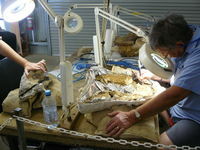 Nice and calm, great way to relax, even though I rolled heaps of tin but only found Bynoe Geckoes. 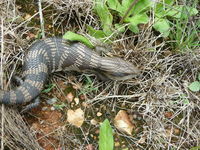 Back on the road again, just before Mt Hope, a Eastern Blue Tongue lizard was walking on the road. 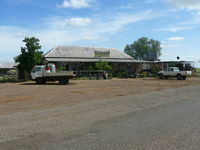 Called into Cobar to fuel up, the lady mentioned they had had inches of rain, but she thought the roads north were still open. Cobar to Bourke there were goats everywhere! A few bloody close encounters with the feral things! 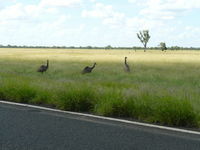 Reaching Bourke the road to Walgett was closed, apparently Walgett had just gone through a wild flood.Onward to QLD, another close encounter with a few more emus. 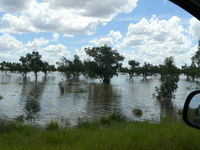 Lots more flooding before Cunnamulla. Fancy that, middle of nowhere and still have to wait for the traffic lights to change – time ticks by and I’m sitting on the side of the road for ages! I arrived at Charlesville at 5:45pm quickly booking into a motel, not knowing what time sunset is. Filled up with fuel, got a bite to eat and hit the road. Cruising along I spotted a Water Holding Frog, hit the skids, the Toyota takes a long time to stop, three point turn to go back, (not like the old Falcon, stops really quick, 180 degree spin and head back quick!) Now I have to drive heaps slower just to stop the big girl, not to mention the three or four point turns just to get back in the other direction. Decide I’ll have to sit on 70kms instead of the 110kms like I’m used to. 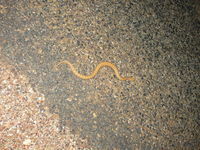 A few Eastern Spiny Tail Geckoes on the road, first snake sighting is a Curl Snake. 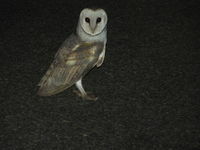 Southern Boobook and Grass Owls, enjoy the night air on the road. Red Kangaroos hop across from time to time, echidnas wonder across as well. 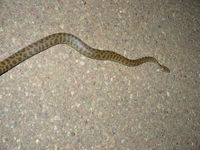 Another snake sighting, what is it? I run back with the torch, it’s pretty slow so I’m thinking python or adder. 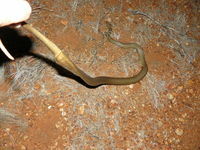 WOW can’t believe it, a Briglo Woma! It’s the first one I’ve ever seen in the wild, I’ve kept them in captivity for years, now I am just bursting with excitement! What will I see next? 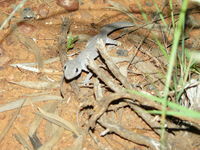 That night I saw heaps of Water Holding Frogs, Spiny Tailed Geckos, three Curl Snakes, a Briglo Woma and a Western Brown Snake – he was too quick, due to the road being narrow and with all the rain the grass was so long I miss playing with him. What a great first night, think to myself isn’t nature wonderful! 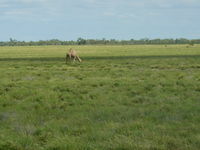 Next day, off to Winton, Brolgas were standing on the edge of the Warrego River and a dead Western Brown Snake 20km south of Augathella, it had just been hit and was still moving. 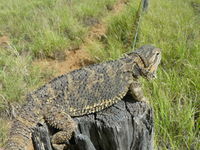 A Burns Lizard was sitting on the road, 20km South of Tambo, Central Bearded Dragons on top of the fence posts South of Barcaldine. The best thing about spotting dragons and monitors on fence posts when you are by yourself is that you don’t turn around for sticks or Skylarks (herps would know what I mean!). 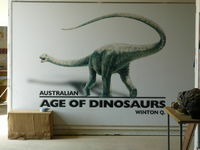 Just before Winton I drop into look at the big lizards, dinosaurs! 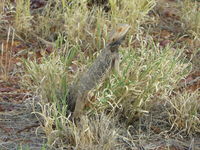 Lots of small dragons running around or sitting on sticks or stumps, beautiful Spinifex Pigeons everywhere! 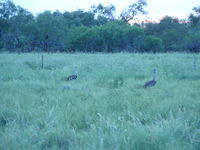 First couple of Australian Bustards walking beside the track. Fuelled up, cleaned the spotlights and front windscreen and headed west, drove heaps of kilometres and didn’t see a thing. 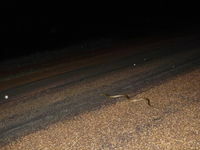 Just before I reached Winton a large Stimson Python slithered across the road. 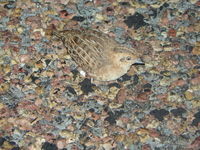 From there I thought I would try the Boulia Rd, heaps of little Painted Button Quail on the road and Night Jars in the sky. 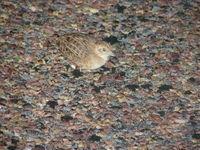 I had taken photos of the Quail, they didn’t bother to move much, I thought I wonder if I could pick them up, no problem. But they shed feathers, WOW nearly bald! 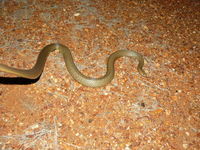 From there up the road to Hughendan, still no other reptiles, back to the motel at 12:30am. Where to next? 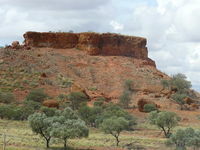 The next day either Boulia or Mt Isa (umm decisions)! Boulia wins, I have never seen a Spencers Monitor in the wild. Heaps and heaps of Central Bearded Dragons to see. 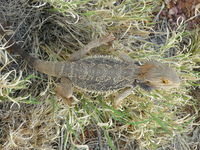 Reached Boulia just before lunch time, book into a motel for a couple of days, got some lunch and as I came out of the cafe I spotted a Burns Dragon sitting on the grass. Later I found them all over the town. Hitting the Donoghue Highway, once again Central Bearded Dragons everywhere. 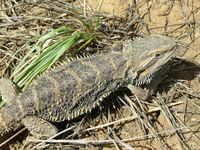 I went to the end of the bitumen and back and couldn’t believe how many Bearded Dragons I could see. 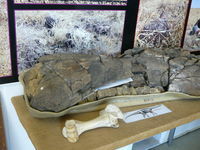 Back up the Djarra Rd, as I went past the entrance to Stockport Station, I thought I noticed a log but it wasn’t. 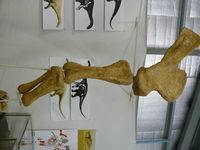 To my surprise it was an adult Prentie, the only other one I had seen in the wild was near Alice Springs. It dove into the Spinifex with a blink of the eye, this one had no cover and made no attempt to run off so I took heaps of photos and film footage-bloody fantastic! 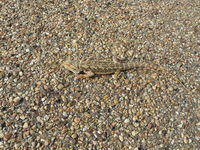 A small dragon zipped across the road, I had no hope of getting photos of him, too fast in the heat of the day, beautiful 38 degrees. Back to town to fuel up and a feed and then back out on the open road, heading to Djarra. I had found a floodway that didn’t look too bad of a spot, I drove 10kms north and 10kms south of it. 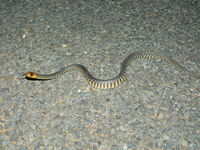 As the sun went down Water Holding Frogs started to hop onto the road next to a beautiful Djarra Death Adder, a Curl Snake and a couple more Djarra Death Adders. 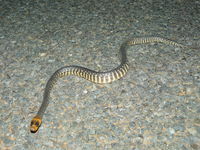 Then I spotted a five and a half foot Common Brown Snake, out in the dark with the torch I tailed it quickly, beauty, I haven’t lost it – the adrenalin was pumping! 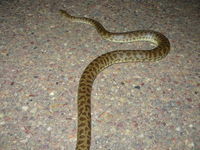 That night the count was heaps of Water Holding Frogs, five Curl Snakes, five Common Death Adders, a Stimson Python, a Common Brown Snake and a King Brown Snake. 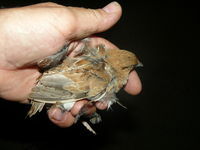 Had a few problems taking photos of the King Brown and the Common Brown by myself in the dark but got there, hands worked well! 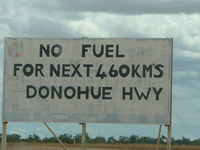 Next day, couldn’t wait to hit to the road, back down the Donoghue Highway. Again Central Bearded Dragons everywhere, two pairs of Brolgas just standing on the side of the road, Australian Bustard still giving me a hard time, but manage to get a close photo. 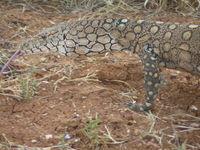 Stopped to move a few rocks, a stunning Leopard Ctentus made a dive under a huge rock, no photo there. Back to the Djarra Road, as I turned off the Donoghue Highway, four Wedge Tailed Eagles were sitting in a dead tree, quick out I got to try and get a closer pic, finally a bit better with the photos. 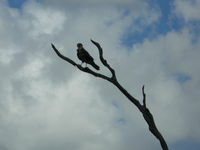 Another group of Wedge Tailed Eagles and Black Kites feeding on the road kill. As soon as I stop they fly off! 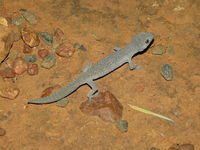 Heading to Soloman Creek at Mick Wright Bridge, I was told I may get to see some Merten’s Water Monitors there, stopping now and again to roll some rocks, finding a Ridge Tailed Monitor. I got to the bridge, parking my car on the old road. As I got out of the car a Merten’s dove into the water. 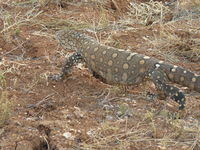 I rolled some slabs off the old road, found more Ridge Tailed Monitors, a large Panoptes shot into the long grass. 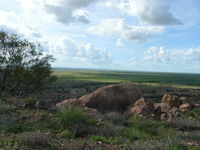 I headed back to Boulia, I remember seeing a rocky hill and thought I might check it out, approx 90kms North of Boulia. 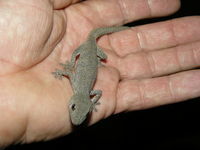 As I was moving the flat slab of rock a large skink shot under a big boulder, what was it? 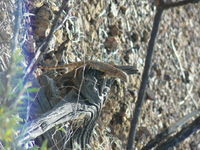 Possibly a Margareta skink, long way from normal range, maybe Egernia Pailsii. 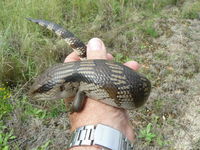 41kms out of Boulia I found another Merten’s Water Monitor lying on the causeway at the Top Limestone Creek, wonder if this is a range extension. Back into town for food, fuel and a window clean. Storms started appear to be West, East and South, could be a good night provided the storm doesn’t cool things down too much. Back out to the same spot as the night before. It started to rain on the way back out, didn’t matter you can still find herp, there are plenty of frogs out. I did a couple of runs, it was now cooler than the night before. 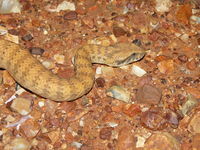 First up was an Eastern Scale Foot and then a Curl Snake. Stop to check out an old toilet block, Tree Dtella were on the wall and some frogs. As I shone my torch light around in the rain I caught something out of the corner of my eye. 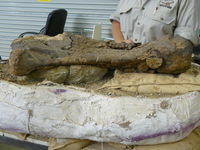 I wonder to myself what was that lying on a slab of concrete. WOW a juvie Prentie, first time I had ever seen a monitor out at night. After taking photo after photo back on the road, a Hopping Mouse is on the road probably getting a drink, the rain is getting harder and I can hardly see. I might as well head back to town, the rain is coming harder than I had ever seen, I was doing 25km with my nose on the windscreen. I could just see knowing the floodways and creek crossing would start rising. 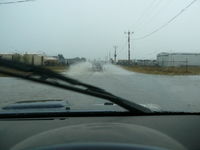 It was bloody hairy as soon as it eased off I drive as fast as I could, floodways were filling fast and it continued to rain hard. I was never so happy to see the lights of Boulia the Top Limestone Creek was flowing over the road sometime during the night, it peaked at 2 metres over the road. That night at least I got see the Prentie, lots of frogs and three Curl Snakes as well as three Scaly Foots and a Hopping Mouse. Next day, wonder which way do I head home, locals have said they wouldn’t recommend east, best to go north. 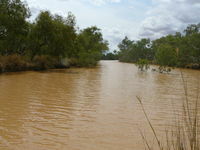 I got to the Top Limestone Creek, it was still 1.5 metres over the road, I was told if I go north and the road is flooded it would only take three hours max to go down. I sat there wondering where that Merten’s is now, up a tree or was it miles away. The water was dropping slowly, a helicopter landed on the road to check that I was ok. I said I was waiting for the water to drop, he said I was wasting my time there was heaps of water still coming, looks like its back east. Somebody in town did say somebody had already gone that way at about 11:30. Here we go, just down the road I pass two Goulds Monitors, didn’t have time to check them out, the sky was getting darker. 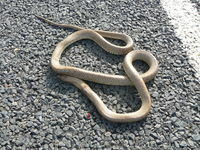 I passed a dead Western Brown Snake, somebody must have got it earlier. I were talking to some of the locals about snakes the day before, they said the only good one is a dead one, if you see them on the road you have to run them over. (Isn’t it nice that people think that way about our cute native animals). 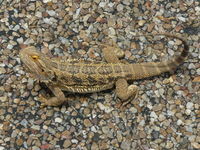 Central Bearded Dragons were everywhere again, it started raining, they were still on the road. Now it was raining hard, the causeways were starting to flow, shitting myself, what will the Hamilton crossings be like? I finally got there the water was just up to the road. I had a big sigh of relief. As I got closer to the hills it started raining really hard, some of the floodway started flooding. 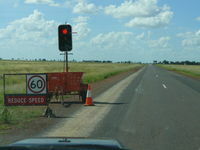 The road was covered, Burn Dragons and Red Kangaroos were everywhere, this started to slow me down. Just before I got over the Adder Creek the water pouring over the road, what do I do? 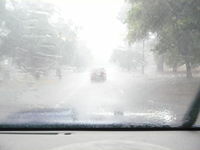 I decided to drive through slowly, the car started to push to the left with the flow of the water. I was shitting myself! I was talking to the car, “Come on we can do it!” Finally I was slowing down as I went up a rise then round a bend, it was flowing fast and I couldn’t go back. I entered the deeper water, the car was wobbling around with the pressure of the water, still shitting myself, all the more talking to the car (I don’t think it helped) but I finally made it! I jumped out to take a photo of the water, I was shaking like a leaf, and the first photos were all blurred. 650mm deep against the car, doesn’t look scary in the photo! Back in the car, gun it, I just couldn’t wait to get off of this road. 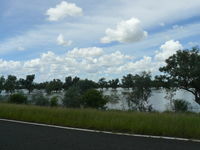 As I got closer to Winton the rain stopped, I got to the floodway and the water was just over the road. Boy was I happy to be at Winton, onward to Barcaldine. 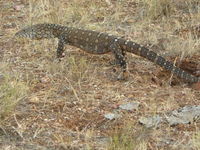 A Gould’s Monitor ran across the road before Longreach. 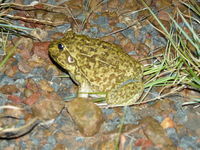 A quick rest in the motel then off to Alpha, I couldn’t believe it, Cane Toads go hopping across the road. 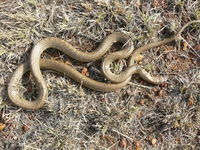 A dead Burton’s Legless Lizard close to Jericho, got close to Alpha another victim, a dead Western Brown Snake. I passed lots of road trains as I headed back. 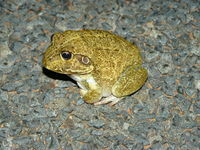 Heaps of Cane Toads, stopped to take a quick pic of one, I called this one four. 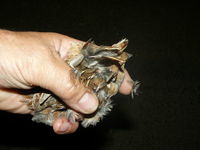 Next day onto Charlesville with hopes of seeing another Briglo Woma, it was a cooler day, bit of rain. Passed a big mob of Grey Kangaroos at Charlesville Airport. That night six Burton’s Legless Lizards, five Fraser Legless Lizards, two Curl Snakes, two Marbled Velvet Geckoes and one Spiny Tailed Gecko. 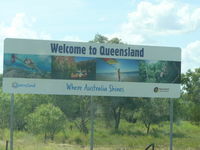 Arrived home Thursday at 2:00pm – 7250 kilometres under the belt and achieved everything I wanted to, excitement, hairy moments, great nature, reptiles, birds, mammals and amphibians. I certainly won’t be waiting another seven years to do this again! But before I go I will be purchasing a new camera to get heaps better shots. 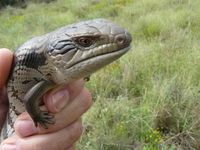 After talking to Steve Wilson found out the large skink was actually one of the Large Ctenotus from out that area, very similar to Egernias. The amount of rubbish people had thrown out of the car windows! (You should be able to be run them off the road as they are only a waste of space on this planet). 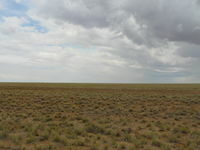 Moray Downs, which is another large piece of Australia sold to an Indian company. When will we stop selling this great country? The QLD government announcing they were going to mine in a National Park for coal. What next, drilling for oil in the Great Barrier Reef? 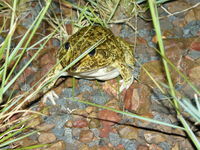 Cane toads found west of Barcaldine, probably even further. 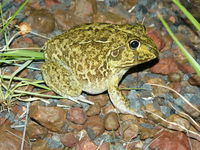 Maybe a Cane toad tax should apply to the families that brought them over. The amount of feral cats out there, one spot near Winton 8 in a pack!